Working at Paper-Ya means being surrounded by endless inspiration. Every time we receive new items, fresh ideas are kindled. My coworkers and customers are an endless source of creativity - each person coming in with a unique background and viewpoint. There is a strong feeling of warmth and brightness that emanates from every corner of the store, and it's something that I've found myself incorporating into my own decor at home. 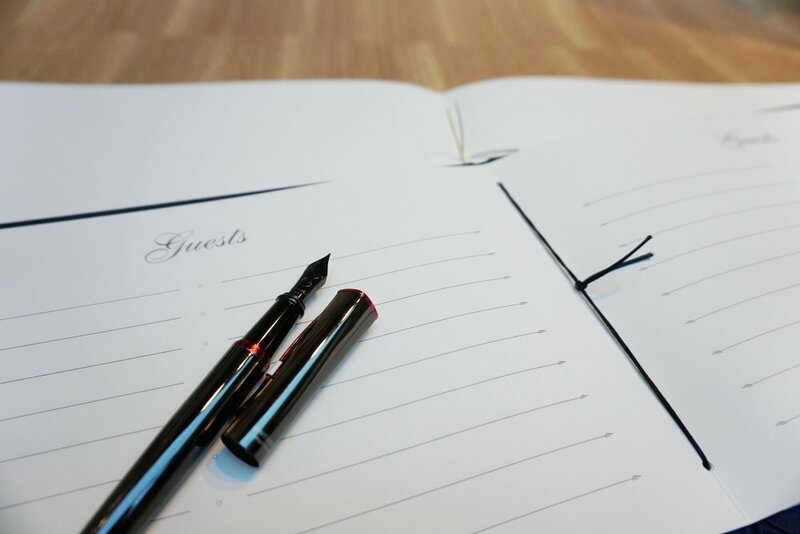 In this blog post, I wanted to share how I incorporated paper, pens, decor, and ideas from Paper-Ya into my wedding. 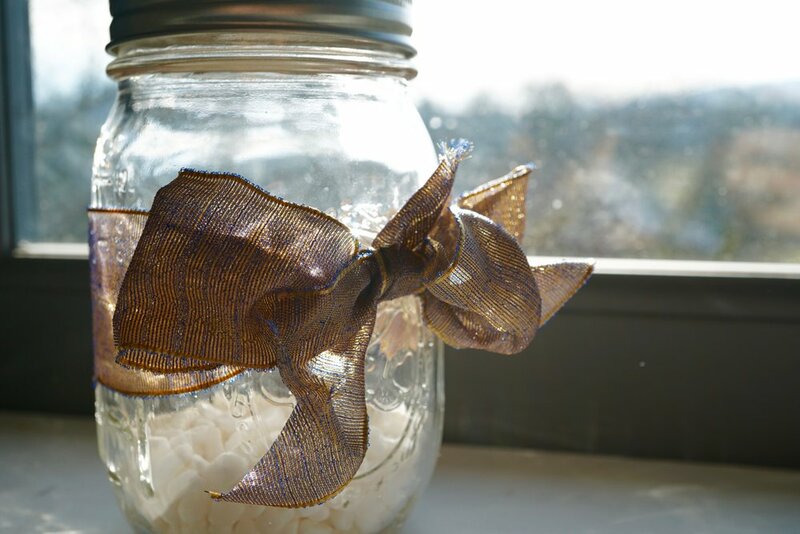 I used some of our thick, shimmering ribbon to tie around mason jars for some simple DIY decor. I placed white rocks and a small tea light inside for a warm, ambient glow as the sun set for the evening. Setting up the reception table! I used Japanese tissue as the foundation of colour and style for my decor. I chose gold and silver, since they were easy to match, and also decorative statements of their own. The fibrous paper stood out against the white tablecloth, and framed my guestbook perfectly. The string lights were a soft, romantic touch. Since they used batteries, I didn’t need to worry about plugging them in or having unsightly cords to tuck away. The warm glow lit up the reception table perfectly. I chose a Japanese-made guestbook with a cover made of Chiyogami. The pages inside are thick enough to handle felt markers, and the first page has a gorgeous wood-pattern design. 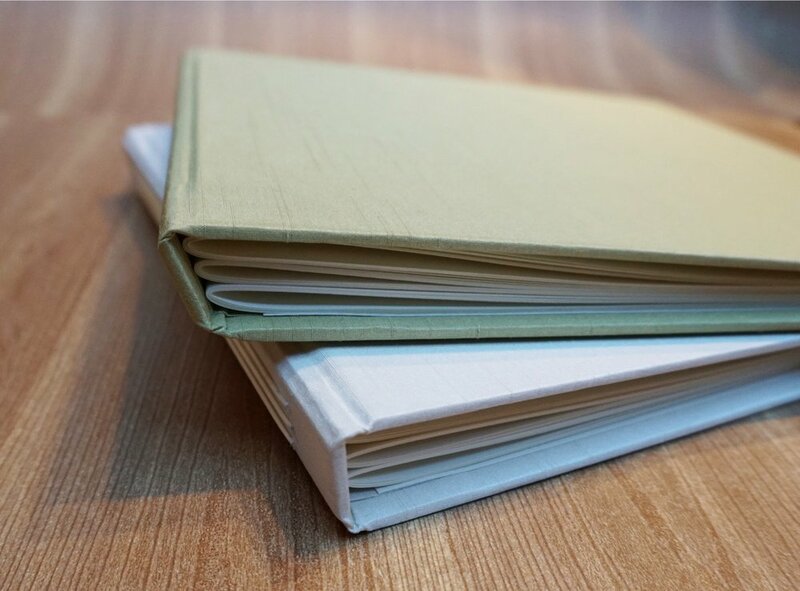 I matched the cover of my guestbook to the Japanese tissue, though most of the time the guestbook lay open, so the cover is less important during the wedding and more important afterwards when it goes on my bookshelf. If we’d had them in stock at the time, our Rag & Bone guest books would have been a strong contender. The raw silk and gorgeous bindings would have been pretty hard to resist. 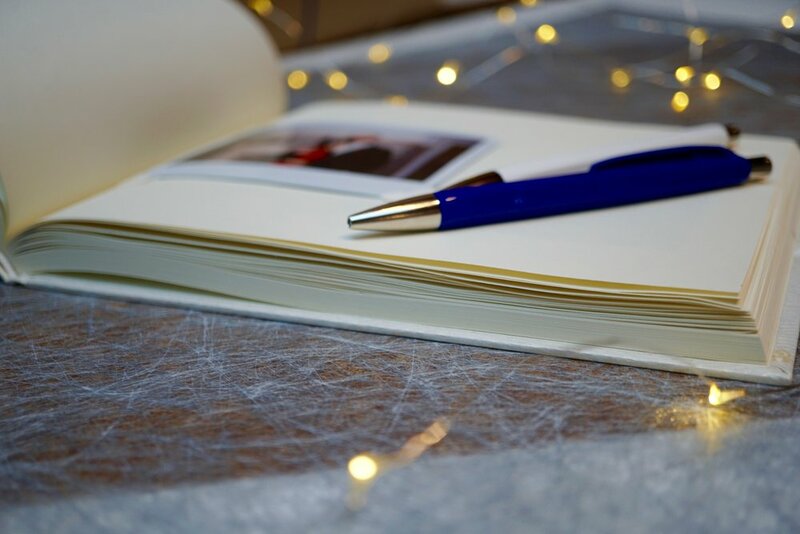 Simple white and blue Caran D’Ache pens offset the strong gold and silver tones of the Japanese paper and guestbook. I chose them for their smooth flow of ink and understated design. I did not want them to overwhelm the rest of the table. Our elegant standing pens would have been another excellent option. I also had a couple of gel pens and markers for added colour, in case anyone wanted to have a bit of fun or decorate their page. It definitely made for some creative designs! Washi tape was my best friend for all of my cards and place cards. I decided to do everything by hand since I was having a smaller wedding and did not need to make them by the hundreds. I used blues and golds for the most part, and used thinner black tape to give a nice contrast in colour and size. My designs were quite random and I had a lot of fun taping everything. I taped the cards before I cut them to get the perfect cut at the edges of the paper. I used slightly iridescent champagne-coloured paper for the actual invitation, and a white card stock for the place cards. 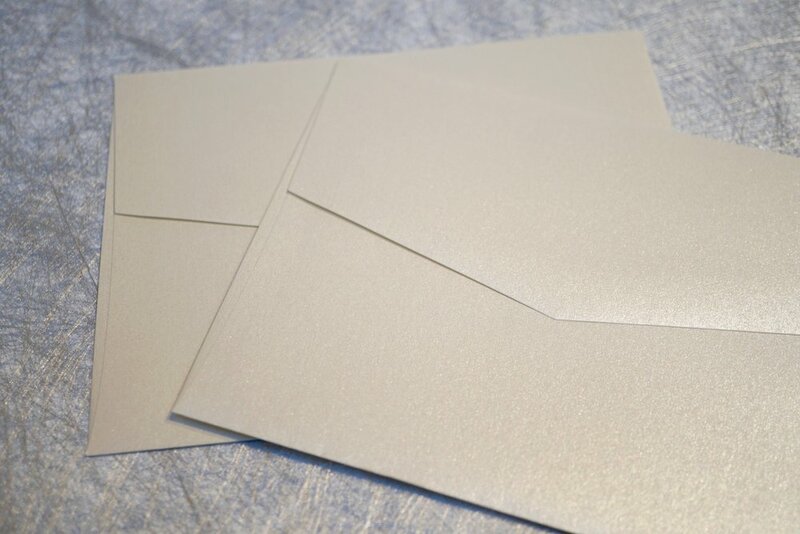 I also used white iridescent pocket envelopes for the invitations, though proper envelopes would have worked just as well. 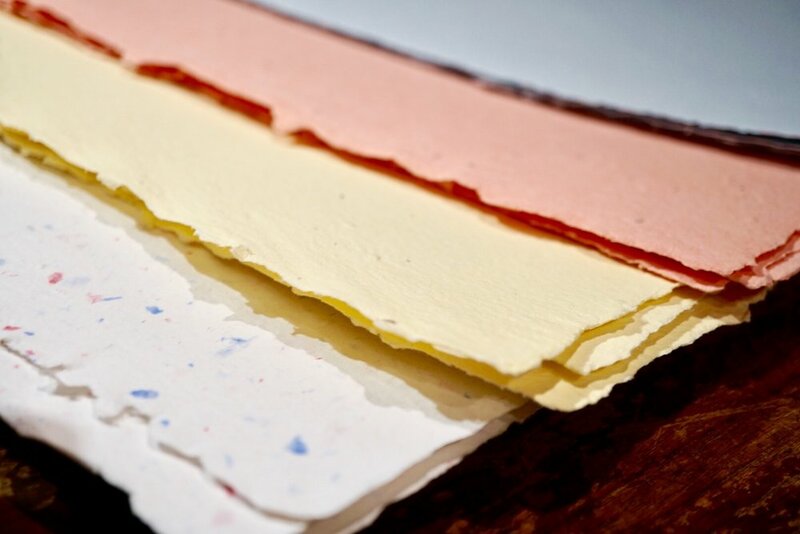 140lb paper, and random watercolour splattering for an effortless, colourful look. I kept my thank-you cards simple, to avoid too much stress on my part. The wedding is over - it’s time to relax! So I decided to make colourful fronts, and include a simple note on the back. I also cut out seed paper that the recipients can plant, as a kind of wedding favour. All of my decor contained a certain warmth and beauty that was influenced by Paper-Ya. It is something you can take away with you every time you visit the store.